Played another run, proceeded a bit further. Third boss got me. Has anyone seen this and confirm to be legit? Considering it's GAME VAMOS, it was probably streamed. Pretty sure it's legit. Here, have a totally useless improvement that somehow puts me up three places. I hope I will get to stage 03 soonly ! Just got this game last week, had only dabbled with it in mame +10 years ago. Yup, it’s as brutal as people say (plus I struggle with toaplan games). [edit#2] slight improvement but god dammit, 5 deaths on the stage 4 boss checkpoint. I just picked the PCB up (for crazy money mind you) and I have to say what a great game but boy is it Donkey Kong hard. I'm spun out by the debug button, I thought it was part of the game and couldn't work out how to use it or why I would? Well, it's a debug button. It's a bit like enabling one of those invincibility dipswitches. It makes the game harder anyway! Probably not a good idea to mess with it. Almost had the boss, died maybe a second before it could. Added PLAYER SIDE. Not sure why I didn't until now. Hopefully I can follow up with Tatsujin Ou shortly. 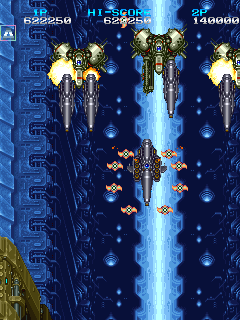 Everyone should watch that final boss fight, if that's not the biggest douchebag in shmup history then I don't want to find out who is. If he is in the second phase and has his body all the way down you need to stay in the corner since his head will shoot out much faster than you can move (even with a speed-up). That means that you have to somehow dodge his tense pattern AND the aimed bullets while not having any space whatsoever since his head is in the way. Tatsujin Ou in the house! Video will follow, it's pretty similar to the Truxton II run overall, though. 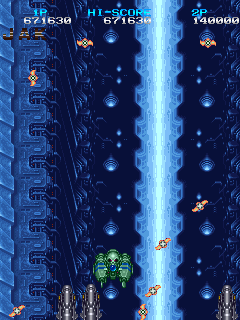 I intentionally picked MAMEUIFX because I thought the bug would not occur here where those enemies don't spawn in the first half of stage 3, but they didn't, anyway. I think it has to do with the second boss, he has a very odd behaviour sometimes and afterwards the highway doesn't scroll fast at first for some reason. I'll point it out once the video is up. For now I can just relax, finally free of this! I might be telling superstitious tripe here, I got no reliable proofs or anything, it's merely from what I've experienced myself. The second boss has a very unusual behaviour which partly seems to be random and partly dependent on what you do, more specifically: how fast you kill the struts (possibly also just by standing close to them). Look how the second strut retaliates with an invisible energy wave; I only noticed it because I had it happen before and because my own straight shot came closer and closer, meaning that it was hitting something. When I first played the game I actually thought the shrapnel kills you since I was point-blanking the struts and immediately died afterwards. Anyway, when that happens the main boss will never do anything ever again from what I've gathered so far, it just sits there until it dies (as opposed to using its spread shots over and over again). 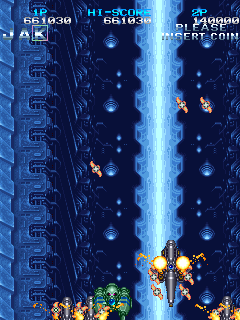 Whenever I got this eccentricity to work (I tried it on several MAME builds because I was initially convinced it must've been an emulation error of sorts) the highway section in the third stage does scroll at a glacial pace, only releasing a single enemy once in a while which you cannot even kill. Once you hit the mid-boss everything proceeds as usual. Maybe there's no relation to the boss at all, as far as my anecdotical knowledge is concerned those events are linked, though. It's also interesting to add that this never happened to me with Truxton II, maybe because the bosses behave differently in that version? Also got saved by the original Tatsujin ship in the end, what a great way to finish the run. Oh damn - I saw you'd taken down Truxton II the other day but knew you'd be going after Tatsujin Ou so withheld comment, should've known you'd bring the beast down before long. Great work and writeups as always! Those comprehensive notes make me want to stop being so lazy and do some ST writing of my own. Almost. I am very lazy. First credit in a while. Did not expect to get this far AT ALL. No missed to the third stage (using a bunch of bombs) and burnt everything on the third boss as I don't know the timeout strat (or any of the secret 1UPs). 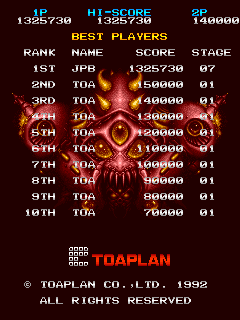 1cc finally , has highlighted the battle against the last boss, luckily I could beat him with the last life, thanks to the first truxton ship that came to help me. Also I have to thank Perikles for their support and tips. Still can't get the hang of the stage 3 boss timeout so after dying twice there I just bombed through. Also my score above should also be MAME 0.194, not MAMEPlus 0.160. I'm just bad at copy-pasting. Didn't move up any places in the board, but wanted to post this anyway because I no-missed through the first three stages (including timing out the stage 3 boss) for the first time. No-bomb too, except for the bomb required for the secret extend. Stage 4 was more intense than I expected since I had only played it on low rank after dying a bunch of times, but I managed to make it to the boss once (where I promptly died while trying to grab a powerup). Nice progress! Have fun with stage 6.